Kaha Lani means "Heavenly Place" in Hawaiian, which describes this beautifully-appointed, two bedroom, two bath, beachfront condominium on Kauai’s magical Coconut Coast. The home of ancient royalty. The view from the living room, dining room, master bedroom, and lanai is of miles of sandy beach and surf. Your condominium is only a few hundred feet from miles of undeveloped, white-sand beaches. 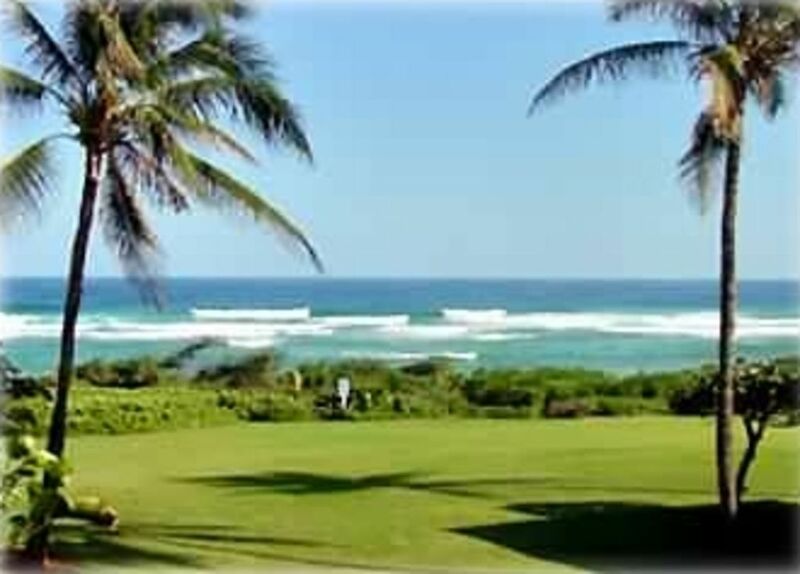 Nestled between the oceanfront Wailua Golf Course (rated one of the best municipal courses in America) and Lydgate Beach Park, this is an intimate and tranquil setting. Alternatively, enjoy a lovely beachfront pool nestled within palm trees and gorgeous landscaping just a few steps from your unit. An excellent lighted tennis court and putting green round out this property. Kaha Lani is centrally located on the island, so you are an easy drive to the North Shore beaches and rain forests as well as Poipu and Waimea Canyon to the south. The nearby Wailua River offers kayaking, hiking, and the famous Fern Grotto. Perfect for couples and families alike, the adjacent Lydgate Park has a protected area for snorkeling and swimming. There is also a toddler swimming area and large playground. This condominium unit has a townhouse floor plan. The unit is on the corner making it very light and bright with windows on three sides. The unit was completely remodeled with new kitchen, bathrooms, flooring, lighting and paint throughout in June 2015. Wood flooring through most of the condo, and a nice, bright kitchen. Bathrooms are up-to-date and the whole condo has a nice feel. The condominium has a very open style where the kitchen is separated from the dining and living areas only by a breakfast bar. The living room and dining room are adjacent to a large lanai, all of which look out over the spectacular beach and surf. Even though there is a dining room, we always enjoying eating on the back lanai while watching and listening to the ocean. And, of course, enjoying the company of the small birds who come to watch! This unit is on the second and third floors. The upstairs consists of a master bedroom and bathroom with more oceanfront views as well. Being up higher yields nice breezes and the sounds of the ocean while sleeping. It also adds just a touch more privacy rather than being on the same floor as the second bedroom. Part of the remodel was knocking out a wall and making a very large master shower. It's a really nice feature and is really nice after a day at the beach! Enjoy whale watching and the sway of the palms while relaxing on your large private lanai, fully equipped with patio furniture and lounges. One bedroom (with 2 twin beds) and bath complete the main floor. All in all, you will certainly be comfortable at Kaha Lani. One thing to consider is that it is a condo, not just one room, so it takes a bit more time to clean well for the next guests. Check out time is 10:00 to allow that time. This is common on Kaua'i. If you are flying back to the mainland, or otherwise have an evening or late flight, many people like to book an extra day so they can relax and enjoy every minute right up until the flight home. This condo was originally purchased by good friends of ours. We bought into it with them and we shared it for many years. They recently moved on but we love it so much we kept it for ourselves. We have been coming here for a long time but it never gets old. We really enjoyed the remodeling a few years ago. It was a fun project and really made it our own. Kaha Lani's location was the main reason we bought this property. Beautifully located in the perfect climate on the Coconut coast, it is situated right between the desert south and the rainforest north of Kauai. Any spot on the island is easily accessible from this central location. This condo provides a second life, away from the normal grind. Relaxing, serene, with beautiful scenery, wonderful sounds and sensation, and friendly inviting island atmosphere. Beautiful unit with Fantastic Beach View. Only steps from the sand. Our condo is on the second and third floors. Lighted tennis court and putting green on the property for your use. We loved the location of this rental. Very central to everything on the island. A little bit off the beaten path which made it feel less crowded. Great views of the ocean. The owner was great to work with. We would definitely stay here again! Thank You Spencer! We would love to host you next time you come to Kauai. Aloha! Our family enjoyed our stay. It was easy to check into the condo and the instructions for our stay were excellent. Unit was clean and homey. Beds were comfy, but we had some trouble sleeping because of the roosters crowing at 3AM! Needed to close the windows at night to sleep....good thing the fans kept us cool. The roosters are charming, but seem to be taking over the island! Thanks for sharing your condo with us! I am glad you enjoyed your stay. Feral Roosters in Kauai are EVERYWHERE! Seems like the locals have gotten used to it but there is no escaping them anywhere on the island. centrally located, nicely done. A very comfortable place to stay. Nice view - very relaxing to sit and watch the ocean. The condo was great. Everything was clean and it was well stocked with everything you'd need for cooking or a day at the beach. Excellent location. This place is great! It's just as described. It's nice hearing the waves as you go to sleep at night. Even the shower in the master bath is REALLY nice. the location also very flexible. You can stay locally at Lydgate park or easily go north or south in a day trip. It's nice that it's quiet. One thing to note is that most rentals in Kauai, including this unit, do not have A/C, so you have to be prepared that it does take a while to cool off, especially upstairs. There always a nice breeze at night so sleeping was never a problem. I would definitely come back to this unit! Whale watching, surf fishing right in front of the unit.